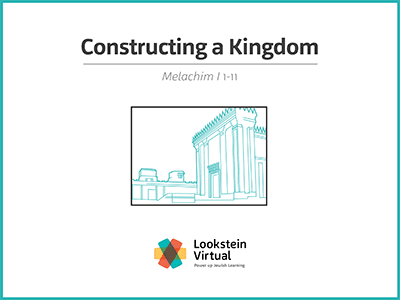 Students will trace the tale of HaMelech Shlomo (King Solomon) from the dramatic intrigue and sibling rivalry that propelled him to the kingship, through the moment of his crowning achievement, the completion of the Temple–the Beit Hamikdash–until his death. By virtue of his skilled leadership, renowned wisdom, and God’s blessing, Shlomo transformed Jerusalem into a vibrant, international capital of a united nation. In this semester-long course, students complete a close reading of the text, focusing on the role and symbolism of the Beit Hamikdash and the leadership of Shlomo.